Before my stint aboard Royal Caribbean’s Navigator of the Seas as a trainee on the Explorations desk—the counter where passengers get information about what to do in ports of call—I thought I could use my knowledge of the ports (Cozumel, Grand Cayman, and Jamaica) to answer people’s questions about places to go and things to see. As it turns out, I couldn’t do any such thing: “We’re not allowed to give recommendations for what to do on the islands outside of the tours we offer, for liability reasons,” said my manager, Nazino Cardozo. “Something that’s safe for one person might not be safe for another.” So when passengers asked me questions such as “Which is the best beach?” or “Where’s the best snorkeling?” I had to bite my tongue. I hadn’t been on any of the ship’s excursions myself, so I couldn’t say from firsthand experience which were the best. Neither could most of my co-workers. One had taken only 4 of the 160 on offer. The hardest thing about my job? Having to tell people that their tours had been canceled. 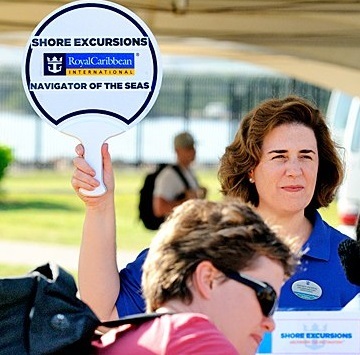 There are several reasons a cruise line might drop an excursion it has been selling online for months: It may have been undersubscribed and thus not profitable (the Cozumel Sea Turtle Snorkel, for example, was called off because only three of the minimum six people had signed up). Or weather or unexpected conditions could make it unsafe (high winds forced us to cancel parasailing). Or the excursion had been offered during the prior season, when the passenger had booked the trip, but was no longer available in the season he or she was sailing. How do you tell someone that the tour their children have been looking forward to for months has been canceled? One father had purchased a Grand Cayman bike excursion, his kids now had their hearts set on it, and he had to scramble to figure out how to make it happen some other way. “Where can I rent bikes?” he asked me. “I’m afraid we can’t recommend local bike rental agencies” was the answer I hazarded. “But you canceled my bike excursion, so now I have no choice but to do it on my own.” I was dumbstruck. My boss was not. Cardozo always had a levelheaded answer and smoothed feathers by offering ten percent off a replacement excursion. There is pressure for the ship to make money from its tours—each week it must earn between $600,000 and $1.1 million in onboard revenue, which includes tour sales—but, said Cardozo, “sometimes it’s not just about the money, it’s about guest satisfaction.” I did notice that once passengers came back from the ship’s excursions, nearly all were highly satisfied—with the exception of the 50 or so who became seasick on the wind-whipped ferry ride from Cozumel to the mainland.